General Tomas has just killed the King and his Council of Privileged magicians in a coup, to stop the country from being sold to their enemy the Kez. Now he and his powder mages must try to keep order in the nation and capital. Investigator Adamat is called in to find out what the dying words of the Privileged meant and later to discover who among his allies is trying to assassinate the General. Tomas's son Taniel, a legendary Powder Mage, is sent to track down and kill his old friend, the last of the King's Privileged. What he finds proves a greater and stranger threat to his father and the nation. 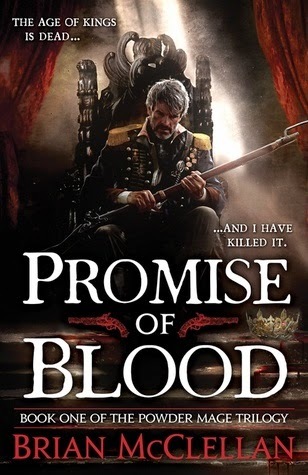 Promise of Blood has magic, warfare, politics and myth and is an impressive open to a series. Set in a world of revolution and gunpowder this story has a different setting and a different feel to a lot of secondary-world fantasy. The existence of gunpowder and muskets, not to mention magic-users who rely on them, changes the traditional sword-based epic fantasy dynamic. Adra is an early-modernish setting, which I found satisfying as it's a period I'm roughly familiar with. There's suggestion of a world beyond Adro and the Kez, and of a history that stretches back into the myths that many modern folk have dismissed. The magic is interesting. Privileged are traditional wizards, with power over elements. They've long been part of the upper classes and are bound to the rulers of nations. Powder Mages are a newer kind of magic-user, discovered along with gunpowder. They snort gunpowder to gain strength, can direct bullets and explode powder. Their existence is a threat to the Privileged and in neighbouring Kez Powder Mages are hunted. Then there are people with Knacks, one magical skill that people are born with apparently at random (a bit like a mutant power). The investigator with a perfect memory and the bodyguard who doesn't need sleep are examples of the Knacked. One thing that is interesting (but I can't go into too much detail about) is how a very domestic seeming form of magic ends up being used very powerfully to affect large numbers of people. Tomas, Adamat and Taniel are the main viewpoint characters, though we also see through the eyes of a servant who protects her young noble charge from the bloodshed of the revolution and its aftermath. Through Tomas we see the political, the weary, difficult, dangerous work of a man who tried to do what's best for his country and found its all more complex than he thought. From Adamat we see a street-level view of the capital, and its covert, criminal world. The investigator uncovers the motivations behind the key players in revolution and the sinister forces that lie behind that. His loyalties are torn between his work and the threat posed to his family. Taniel, who has been abroad on campaign for a while, and is quickly sent away from the capital again so he doesn't have to face his fiancee who cheated on him. He heads to a sacred mountain to hunt down his oldest friend, who may pose a threat to his father and discovers he's on the front line of a possible invasion, from armies and magic. The characters, viewpoint and otherwise, are all complex with understandable motivations and they have backstories that crop up naturally throughout the story. Adamat tries to do what's right and protect his family, while Tomas and Taniel have a chilly father-son relationship. The story was engaging, although different to what I expected. I thought it would be more about warfare and was pleasantly surprised by the investigation and political plotlines. There was also more magic and mythology than I expected. The myths and legends of the area are spelled out gradually and are far more present than I -or most of the characters- would have expected. This is an interesting read that tells a good story and sets up interesting and surprising events for the next book in the sequence.